How competitive are your auctions? Reasonable buyer’s fees often trigger competitive bidding, especially at Proxiblog honor roll houses. Unreasonable buyer’s fees have the opposite effect, attracting sharks who know that onsite buyers will run out of cash and online buyers will bid conservatively. Here’s an easy way to attract top consignors or to gauge your own auction’s selling power: After each session, tally realized, wholesale and retail prices for each PCGS or NGC coin. Chances are, if you’re a top auction house–such as those in Proxiblog’s rankings (see list to the right)–you’ll have sparked enough competition to approach or surpass retail values. Proxiblog selected three lots at random at the May 30 Scott Auction run by Scott Strosnider, one of our top auctioneers. Lot #51 1921 ALABAMA COMMEMORATIVE HALF NGC MS63: Realized Price $368. Wholesale Price $257. Retail Price $390. 94% of retail value. Lot # 16 Hot Lot! 1925 FORT VANCOUVER CENTENNIAL COMMEMORATIVE PCGS MS63: Realized Price $437. Wholesale Price $297. Retail Price $450. 97% of retail value. Lot #33 1888-S PCGS MS62 MORGAN SILVER DOLLAR: Realized Price $368: Wholesale Price $250. Retail Price: $380. 96% of retail value. Now let’s do the same with an unnamed Proxibid house charging 22% buyer’s fees. Lot # 595 1943-D JEFFERSON NICKEL PCGS MS-66: Realized Price $12. Wholesale Price $27. Retail Price $42. 29% of retail value. Lot # 358 Hot Lot! 1874 INDIAN HEAD ONE CENT NGC MS-65. Realized Price $518. Wholesale Price $514. Retail Price $780. 66% of retail value. 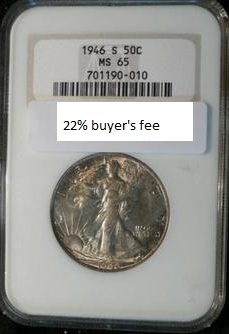 Lot # 1477 1946-S WALKING LIBERTY HALF DOLLAR NGC MS-65. Realized Price $79. Wholesale Price $111. Retail Price $169. 47% of retail value. As you can see, Scott Auctions are competitive. That’s the goal. With a 15% buyer’s fee or less, plus clear and expandable pictures of obverse and reverse, you’ll attract consignments and invigorate your sessions. This entry was posted in Articles, Best Practices, Featured Updates, Honor Roll and tagged American Numismatic Association, Auctioneers, Best Practices, Coin Auction, National Auctioneer Association, NGC, PCGS, Proxibid, Proxiblog, Scott Auctions. Bookmark the permalink. Isn’t the real question what the consignor nets for these coins with the high buyer’s fees? Many auction houses charge 15-20% to the buyer, as well as 10-15% to the seller – the spread between the buyer and seller is simply too much in my opinion. I agree. Proxibid is a wild but upcoming auction portal, Ian, where buy-sell fees are still associated with local practice rather than online reality. I have a piece upcoming in Coin World on how sharks raid auctions with high onsite/online buyer fees. The realized vs. retail prices are a gauge of competitiveness; but you’re right. To truly get an accurate measure, we’ll also have to know the consignment fee.